Right where the eastern coast of Liguria meets Tuscany is the beautiful, rugged coastline of the Cinque Terre along the Italian Riviera. Dotting the Ligurian Sea, the Cinque Terre is comprised of 5 seaside towns set along the cliffside: Manarola, Riomaggiore, Vernazza, Monterosso al Mare and Corniglia. In total they make up another UNESCO World Heritage Site of Italy and National Park. Many flock to this area for the famous walks/hikes between towns ranging from easy to more difficult as you progress. Some go for some rest and relaxation within the towns themselves watching the local fisherman at work under the Mediterranean sun along the pebbled beaches and crystal blue waters. The Cinque Terre over time has suffered from landslides and erosion and the terraced structures somewhat help save the structure of the land from further damage. Tourists are playing a role also in the damage to this area. According to the Smithsonian Magazine, in 2015 2.5 million tourists visited the Cinque Terre, which is a tremendous amount for not such a large area. In upcoming years the Italian government plans to limit the amount of visitors to around 1.5 million by having visitors purchase tickets to visit the area. I'm all for preserving a piece of our earth whether it's land, animals, etc. so if this will help the area recover, so be it! What's unique about the Cinque Terre? What some may not think of when they think of the Cinque Terre are the unique wines themselves and what makes this area so special for wine production. You actually have the opportunity to stroll through some of these vineyards as you make the journey from one village to the next. By supporting the winemakers of this region and drinking the wines of the Cinque Terre you're doing good not by your own personal gratification of the wonderful wines produced here, but also you are contributing to support a piece of history from the years of winemaking in this area and protection of the land and National Park. 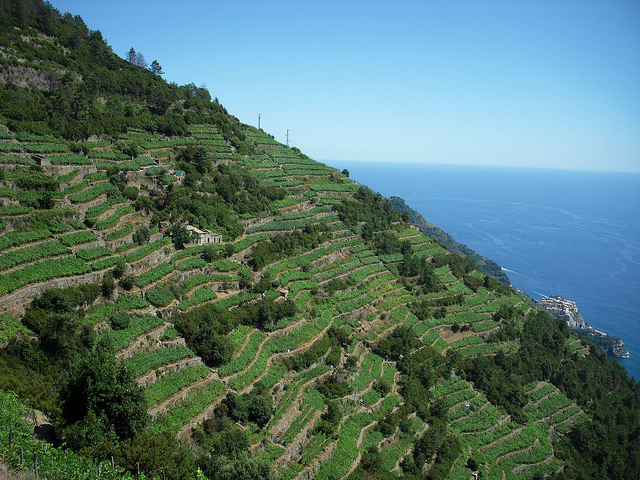 The challenge to winemaking in this area of the Ligurian region is the makeup of the landscapes. Known for it's steep, terraced walls, this is what provides the greatest challenge to wineries as the grapes need to be handled manually. 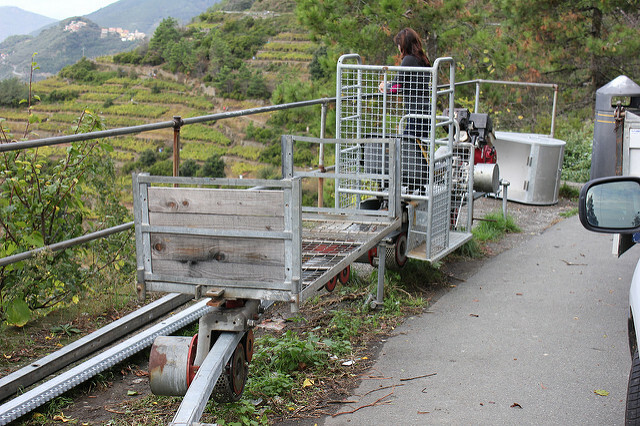 When it's time to harvest a monorail system helps haul the basket of grapes from the vineyards down the steep terraces to be loaded onto trucks and then hauled off to the production facilities. White grapes such as bosco, vermentino and albarola are the main varieties here. These grapes produce still wines, but also a special dessert wine of the area known schiacchetra, pronounced shak-eh-tra. This is a wine where the grapes are dried out on mats and shriveled more like raisins resulting in wines that have more concentration and are full-bodied with flavors of honey and dried fruits. 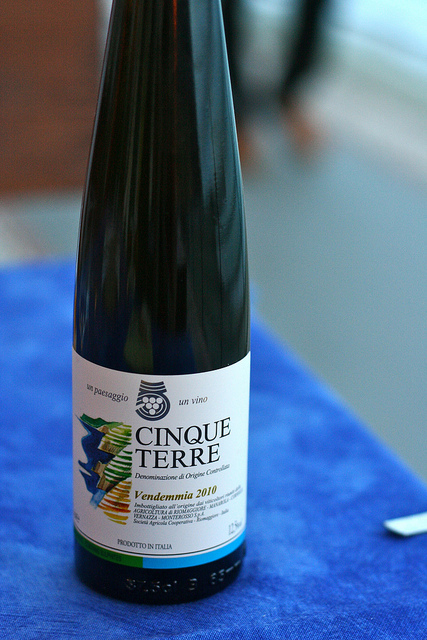 The white wines of this area are a perfect accompaniment to the fresh seafood pulled right out of the Ligurian Sea or maybe even the specialty, pesto alla genovese, over pasta of which this area is known for. Plus lots more Ligurian recipes can be found from our Italian Food, Wine & Travel's group when we featured Liguria. Why don't we see this wine in the United States and around the world? It's mainly because much of the work in the vineyards are conducted by an older population and production is small and limited as well as a small amount of wineries. So it's so important if you visit this area or have an opportunity to try not only the schiacchetra, but any of the wines of the Cinque Terre, that you partake in a piece of history within your glass. There are Red and White, but Orange Wines Too?